The Perfector provides a natural, non-invasive alternative to cosmetic surgery, delivering low-frequency micro-currents to build up skin layers, thereby healing and encouraging cell renewal and regeneration of tissue. Perfector treatments are proven to bring about changes that are immediate and long lasting. It offers both corrective and preventative anti-aging treatment with no downtime. The Perfector is a cell regeneration system based on the Nobel Prize winning discovery that the cell membrane contains a specific amount of electricity. 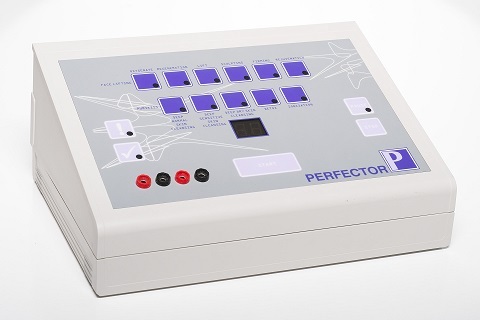 Only the Perfector offers the cell the specific amount of electricity needed for the skin regeneration by adjusting the electrical impulse depending on one's skin type and thickness. It garnered FDA approval in the US in 1992. As we age, skin cell production begins to slow down, resulting in a buildup of dead skin cells, wrinkles, and sagging skin. The Perfector creates a proliferation of fibroblasts which produce the proteins needed to heal the skin. Additionally, it works on the nerves and muscle cells to increase tone of the fine facial muscles.